North America's bats face many different threats to their survival. To identify and prioritize conservation actions, it is important to describe and identify those threats. The North American Bat Conservation Alliance (NABCA) asked bat conservation experts from throughout North America to identify potential threats. Many ideas were obtained through a workshop at the North American Joint Bat Working Group Meeting held in Saint Louis, Missouri, on 3–6 March 2015. These were then organized based on IUCN threat categories. 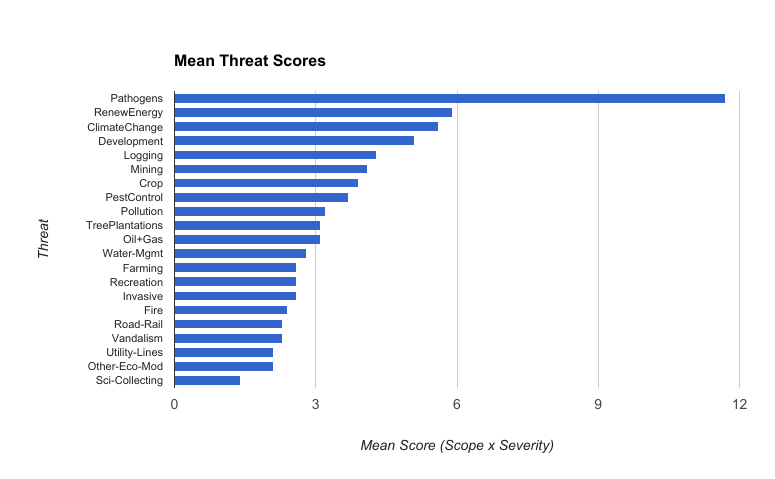 Further information on each threat, including geographic variation in the apparent threat, together with approaches for addressing each threat are presented in the section "Addressing Threats". Hammerson et al. (2017) carried out an analysis of geographic and temporal patterns in conservation status of North American bats, to look at the characteristics of each species that most influenced its conservation status. O'Shea et al. (2016) undertook a different type of review, looking at "Multiple mortality events in bats: a global review". They focussed on situations where multiple dead bats were associated with a single event / location. They thus identified a subset of threats, that lead to direct mortality of bats in ways that the carcasses are likely to be found by humans. This would not include threats that lead to loss of habitat, but no dead bats.